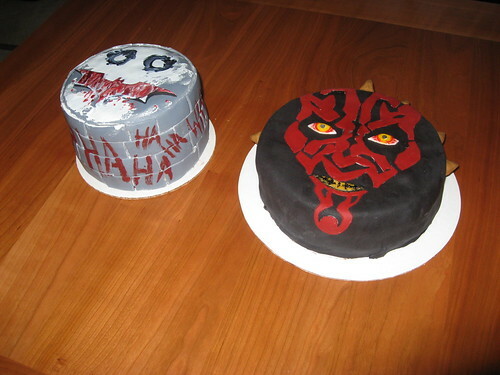 The Darth Maul and Dark Knight cakes! Yesterday, my 3 nephews (kyle-14, nathan-11, and jack-6) and my dad, all had their birthday party in a beautiful park in Linden, MI. The boys had put in a request for me to bake some special cakes for them. 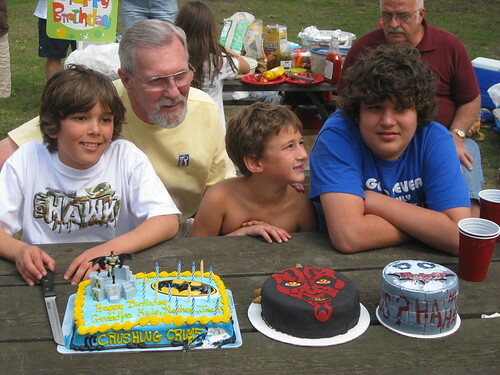 In particular Darth Maul (from Star Wars), and a “Dark Knight” themed cake from the new Batman movie. So Friday, I took the day off of work and just spent the day bakin’ it up! My fiance, Christopher, (a Star Wars illustrator), came in very handy when it came time to do the serious decorating. His skills with a paintbrush and an exacto knife were amazing. Take a look for yourself! They were a HUGE hit with the boys, and everyone at the party. YAY. Check out the whole set off pics on my flickr here. Nice cakes! I haven’t seen your dad in a while. Congrats on getting engaged! When is the wedding? Maybe next year you and you fiance can come to visit me in the Buf (only about 4hrs away).